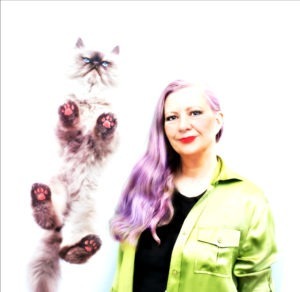 Odin recently had the pleasure of interviewing Sparkle Cat, the famous feline blogger, writer and advice columnist. She won the Best Cat Blog award last year at the Petties and is nominated this year in the Best Blog Post category. Odin was awed not only by her beauty, but her brains and heart. As a neophyte journalist he took copious notes. When Sparkle Cat speaks, everyone listens. She has our vote. Here’s what Sparkle Cat had to say about her nominated article on feral cats. “I think there is a lot of misunderstanding about what feral cats are, and what it means to be a feral cat. So for Feral Cat Day last October, I wrote an article that makes that clear, from both a human and a cat’s perspective. I included suggestions on how humans could help ferals, and how we house cats could celebrate our feral brothers and sisters. It’s one of my favorite blog posts. The plight of feral cats is very close to my heart, and I do anything I can do to raise awareness. “Which brings me to my choice of shelters to receive the donation money, in the event I win. Like last year, instead of choosing one myself, I invited my Facebook and blogging friends to suggest shelters to me, with the caveat that they do a lot of work to help feral cats. I got some GREAT suggestions! So I am currently running a poll so that my readers can vote on their three favorites (you can read about each one here: http://www.sparklecat.com/special/blog-the-change-for-animals-petties). Voting closes on July 29 (the same day voting for the Petties closes). The shelters that come in first and second will split the donation money if I win, and the shelter that comes in third will get a ChipIn donation widget on my blog for the whole month of August. So no matter what, somebody wins! We always keep track of Sparkle and what she is up to so we have been voting for her regularly. How cool! Sparkle really is very bright and very special and thanks for sharing a great interview! We’re big fans of Sparkle, too, and hope she wins! we absolutely ADORE Sparkle and her talented Mommy!!! I know all of the feral kitties appreciate her as well, she has our vote! Yes, let’s not forget her awesome mom, Janiss. 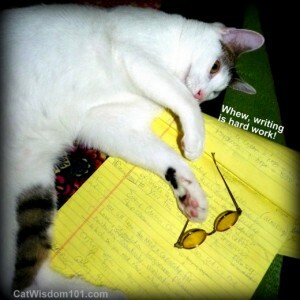 Sparkle is the best and of course feral cats are my favorite subject.We love reading her blog and her books. Great interview here. Hope Ling Ling is doing all right. Take care. Marg, thanks. I’ll do a full report on Ling Ling for Cat Saturday.